Yaks have been in the Himalayan mountains for thousands of years. Tibetans have been herding yaks on the Tibetan Plateau for centuries and using their hair or fibre to provide shelter and clothing for their families. Yak fibre is an essential part of the lives of Tibetan nomads and has some very unique qualities. Yaks have two types of fibre: coarse hair and fine down. The coarse hair is typically black and is what you see when you look at a yak. It’s the outside coat that protects the yak from the elements, whether rain, snow, high winds, or even the intense summer sun. This very coarse hair is used by Tibetans to make tents, ropes, and hardy loose-fitting outer coats. The inner soft down gives the yak its warmth for those high plateau winters. The yak down is very fine, making it perfect for articles of clothing worn against the skin. It is said that yak down is softer than cashmere, with more warmth for its weight. The hair and down is harvested in spring as the temperature rises. These fibres fall off the yaks as they shed, but can also be plucked or gently pulled off by the herders. On rare occasions a pair of scissors is brought out to gather the hair and the fibre. 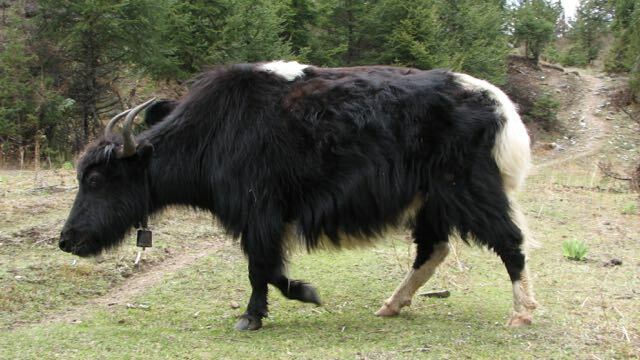 Most yaks have a black outer coat of hair with a brown or grey inner coat of down. There is also the more rare white yak. Each year a yak typically sheds about 100g of down fibre. The rarity of this down fibre contributes to its cost. Tibetans have been gathering yak fibre for hundreds of years and only now is the rest of the world learning about this beautiful fibre. Bringing this natural fibre from the high Tibetan plateaus to world’s markets is well worth the effort.